The Altadena Mountain Rescue Team, along with search and rescue teams from Sierra Madre and Montrose, rescued two hikers on Tuesday, June 25, in a complex technical rescue that lasted until the early morning hours. According to a release from the Altadena Sheriff Station, members of the Altadena team were called out to a rescue in Eaton Canyon at about 6:36 PM. Two hikers, trying to find a waterfall, wandered off the trail at Acrophobia Ridge toward Power Line Trail. The release said that family members of the hikers contacted the Downey police department when the hikers did not return home, and Downyey notified the Sheriff's Department. Montrose and Sierra Madre teams were called to assist at about 8:20 PM, according to the release, "as the position of the hikers was extremely precarious and dangerous. 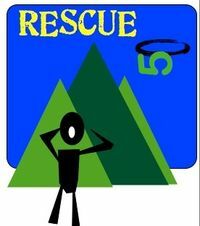 The expertise of all three teams was needed to handle the sophisticated operation that used harnesses to pull the hikers off the ridge and to safety. The operation ended in the early morning hours. There were no reported injuries. "